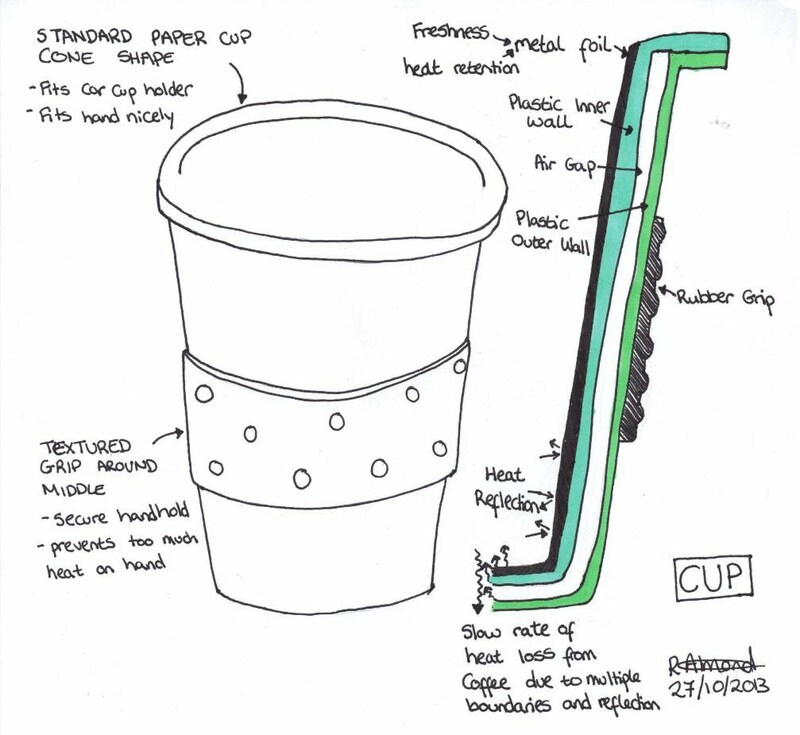 When designing a solution to the coffee cup problem that works for me personally I was able to break the product down into two parts the cup and the lid. I like the feel of the paper takeout cups. They fit nice in my car and are a good size for my smallish hands Of course these cups still tend to leak but its the shape I was focused on so I used this as my starting base and elaborated from there. Next I looked at the design of the lid. The most common problems for me are the seals are just not good enough to prevent the liquid escaping and the screw threads trap the liquid to drip on me at a later time (like when I lift the mug to take a drink). The lid on my current mug also has the flaw that while the cup itself is thermally insulated the lid is not so is freely allowing heat to escape. 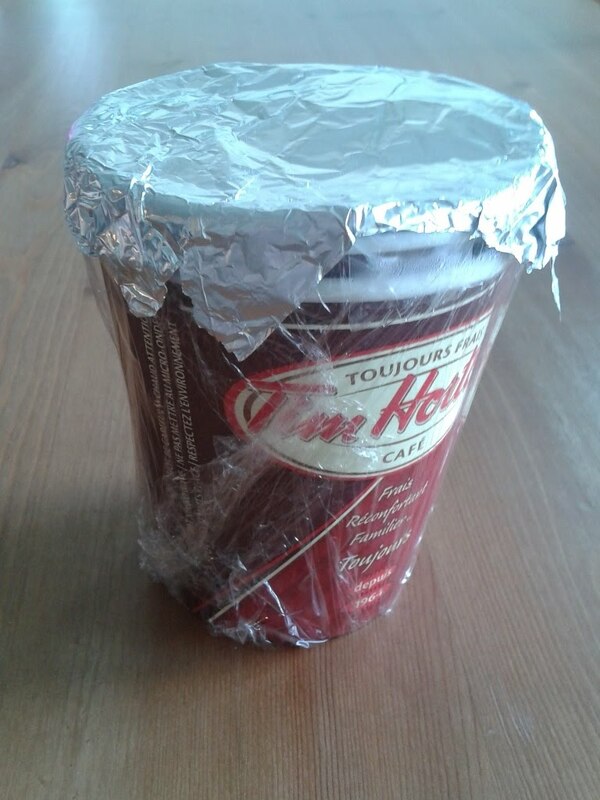 Using this idea, some paper cups, aluminium foil and tape I was able to build a model to see how well the idea works. Obviously paper is not representative of the heat conductivity properties of plastic but as an initial tester base it works just fine. 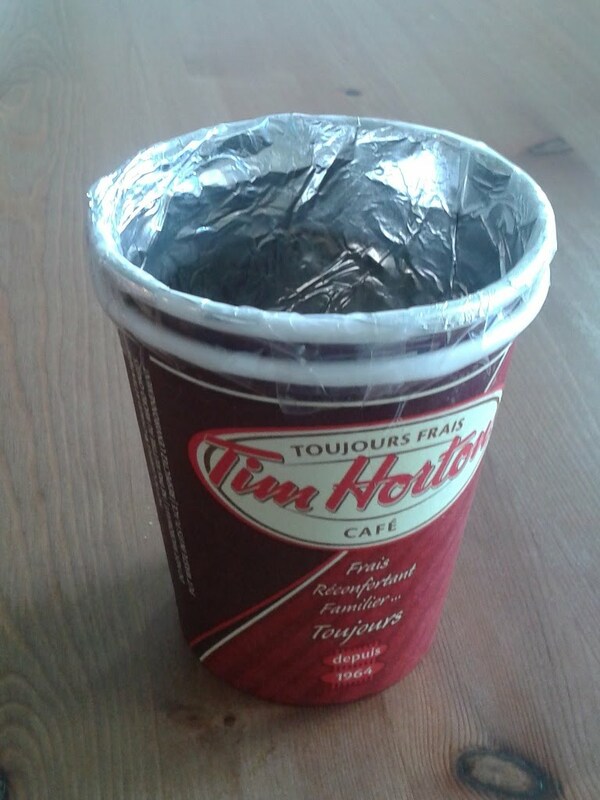 I tested my model by pouring 1 cup of boiling water into both my prototype and a standard single layer paper cup and covering with a thin layer of plastic wrap to avoid spills and a foil 'lid' layer on the prototype version. I then waited 20 minutes (the length of my morning commute) and then had sip from each cup to see which was a better temperature. The foil lined double layer was a clear winner with some (very small amount) steam still coming off the liquid when the lid was taken off. This gives me some confidence that this concept may be feasible for a developed product. 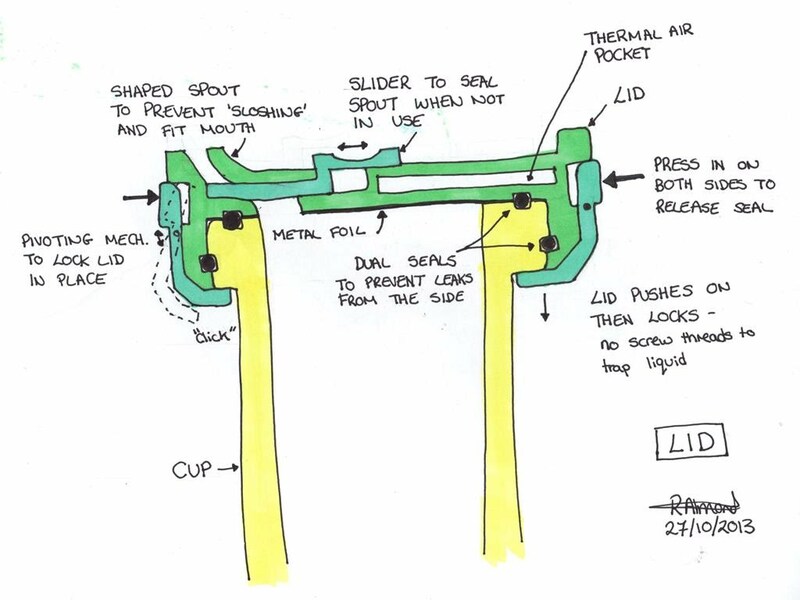 Because of the complexity of the inner working of the lid and the need for real engineered materials to test the concept further prototyping of this wasn't possible just yet. That being said the use of the foil on the paper cup did show some ability to trap the heat from the top and give better insulation through pure reflection.